A great cup of coffee is a cup you like to drink. If we want to dive a little deeper into making coffee, we’d say that a great cup is one that’s extracted evenly, pulling out all of the good qualities of the coffee while leaving all of the bad qualities behind. When brewing at home, a great cup should also be one you enjoy making. We don’t believe there’s only one right way to make coffee. If you don’t enjoy what it takes to make the “perfect” cup at home, then it’s not perfect for you and we can find a method that works best! When we talk about coffee brewing, we’re talking about extraction. We can combine and change variables like the time coffee is in contact with water, the quality of the water, how even and how fine the coffee is ground, the temperature of the water, and how much we disturb or agitate the grounds to create an even extraction that leaves the coffee balanced in sweetness, acidity, and bitterness. With so many variables taking place in coffee brewing, one of the ways we can control for them is by using brew recipes. 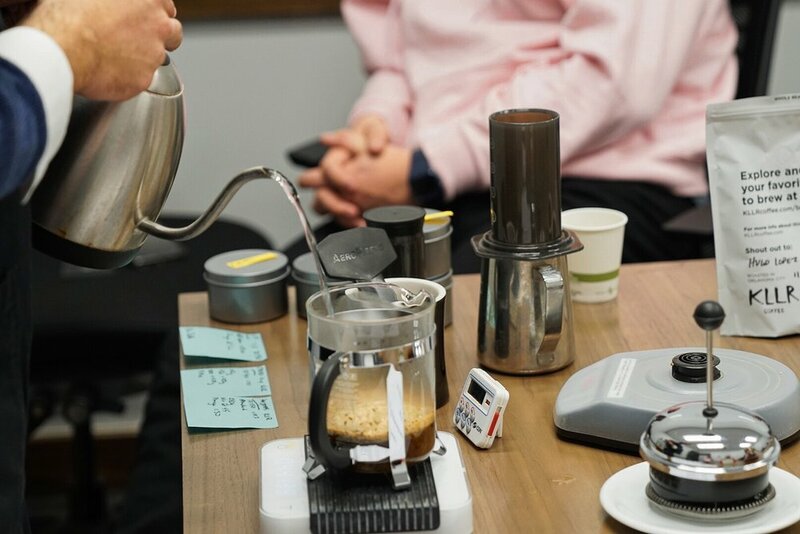 We discussed how variables like grind and time work with each other and how using brew recipes that come from companies whose coffee you enjoy is a great place to start. In the class we discussed recipes from KLLR, Heart, Ritual, & Blue Bottle! As always, we love talking about coffee. Anytime you have a question, we are more than willing to hunt down the right answer and find a solution that works for you! We loved taking these fun deep dives into various parts of the coffee experience! If you’re interested in learning more about our monthly events, you can sign up for our email list here!